(From l – r) Gurnal Jones, Kristine Olijnyk, Cory Brownsten, and Rocky Delfino will be honored at MCC’s Hall of Fame banquet on Oct. 5. ROCHESTER – Three former star athletes and an award-winning coach will be inducted into the MCC Sports Hall of Fame this fall. 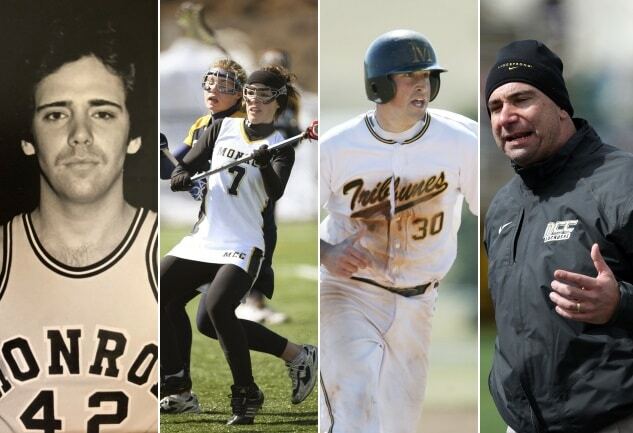 Gurnal Jones, Kristine Olijnyk, Cory Brownsten, and Rocky Delfino will be honored at MCC’s Hall of Fame banquet on Oct. 5. Jones was a high-scoring guard/forward for the Tribune men’s basketball teams during 1981-82 and 1982-83 seasons. Jones averaged 17 points per game over his two years and totaled 905 points. The Irondequoit native then went on to immense success on the hardwood for St. John Fisher College. He will be inducted posthumously. A Webster native, Olijnyk starred for the MCC lacrosse teams during the 2008 and 2009 campaigns. A two-time, first team NJCAA All-American, she helped guide Monroe to a pair of Region III championships as well as the program’s first national title game appearance in 2009. She finished her MCC career with 99 goals, which is still the most in team history. Brownsten was a catcher for the 2007 and 2008 MCC baseball teams, helping lead each edition to the NJCAA Division II national tournament. He was instrumental as Monroe won a program-best 41 games in 2008, garnering first team All-American honors while being named NJCAA Defensive Player of the Year. After a successful stint at the University of Pittsburgh, Brownsten was taken in the 15th round by the Atlanta Braves in the 2010 Major League Baseball Amateur Draft. Delfino led the Monroe men’s lacrosse team for nine successful seasons, compiling an overall record of 105-32. He was a two-time Region III Coach of the Year, led Monroe to a national tournament appearance in 2004, and earned NJCAA National Coach of the Year honors in 2005. Delfino has taught in Monroe’s Health and Physical Education department for 20 years and is currently the head men’s lacrosse coach at Roberts Wesleyan College.